This beginners guide to animal bone identification has been written by Chris Faine and is one of a series of introductory guides published by the community archaeology network, Jigsaw. Animal bone is one of, if not the, most commonly recovered finds material from archaeological sites. Identifying the full range of species that you could potentially find on an archaeological site requires access to a comparative collection and hours of study gaining experience with archaeological material. Whilst this is beyond the scope of a short introduction, having the knowledge to identify the most commonly found species can be of great help on site. This guide will hopefully enable you to distinguish between human and animal bones and broadly distinguish between cattle, horse, sheep, pig and dog remains. Whilst size can be a useful guide initially don’t rely on it completely. Shapes and sizes of most domestic breeds have changed considerably over time with the differences between modern and older breeds being often quite pronounced. For example the difference in average height at the shoulder between Iron Age and Modern cattle can be as much as 40cm! Fragmentary cattle and horse remains are often confused given their similarity in size but there are several elements that demonstrate significant differences (aside from the horns!). 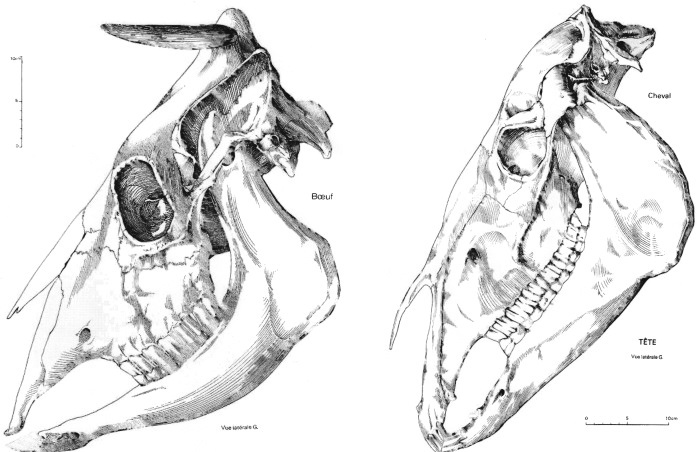 Figure 1 shows the skulls of the two species. The most important differences to note are the much smaller skull vault in horses compared to cattle and the difference jaw shape. The front of the skull will be much flatter and broader in cattle as well. If teeth are available then identification is much easier, with teeth of the two species (particularly molars) being very different. These can be seen in Figure 2. As one can see horse teeth are much squarer in profile and plan compared to cattle teeth with a radically different enamel fold pattern. Cattle and horse long bones also show very distinct differences especially (but not exclusively) femora and metapodials. 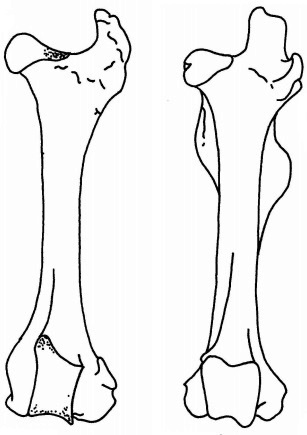 Figure 3 shows cattle and horse femora. The most apparent difference in these bones is the much larger muscle attachments at the proximal end of the horse femur compared to cattle (horses run faster than cattle!). Differences in metapodia are also a result of physiology. Cattle belong to the group of mammals known as artiodactyla, (even toed hoofed mammals), whereas horses belong to the group Perissodactyla (odd toed hoofed mammals). 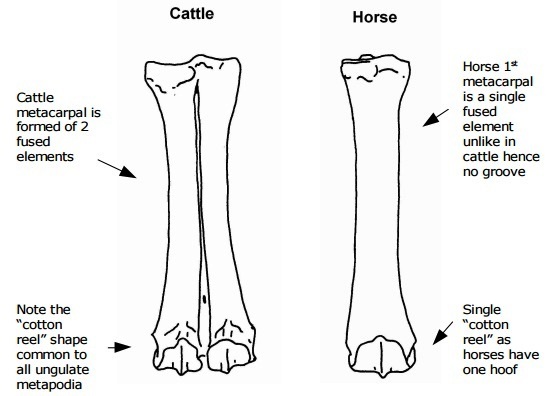 As one can see in Figure 4, cattle metacarpals are formed of two fused bones leaving a groove between the two. Horse 1st metacarpals consist of a single bone. Cattle have two hooves leading to the distinctive double “cotton reel” at the distal end whilst the horses only display a single “cotton reel” because of the single hoof. Cattle and horse astralagi are also distinctive (see Figure 5). Horse astragali have a different shape to most ungulates due to the structure of the lower limb. As with cattle and horse remains, sheep and pigs are often confused due to their similar sizes. 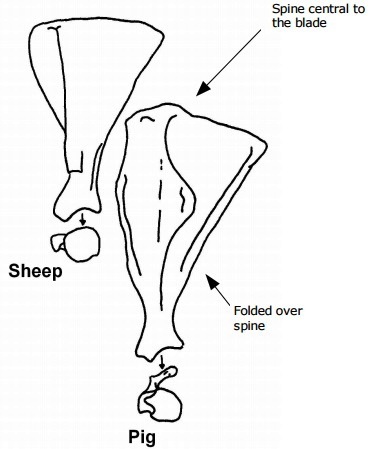 Figure 6 shows the differences in sheep and pig skulls. 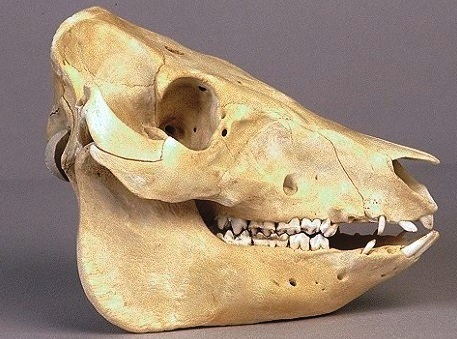 The most notable difference is the much higher and flatter skull vault in pigs compared to sheep. Note also the different profile of the mandible. Luckily pig teeth are the most distinctive of the domestic mammals. 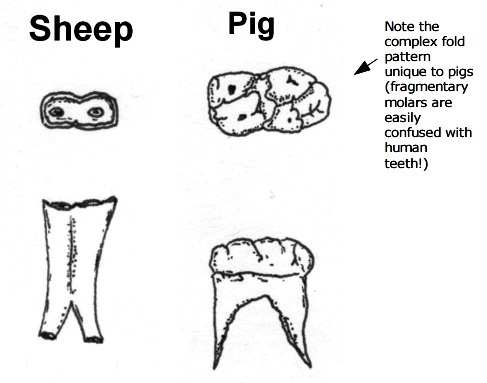 Figure 7 shows both pig and sheep molars. 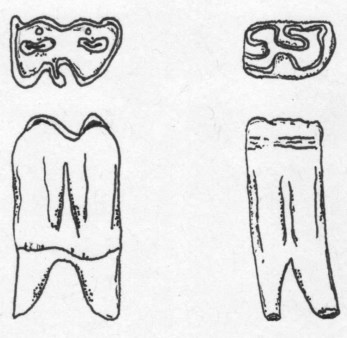 The different shape of the cusps on the pig tooth is immediately apparent and is very different from the “W” shaped profile of sheep teeth which look somewhat look like miniature cattle teeth. 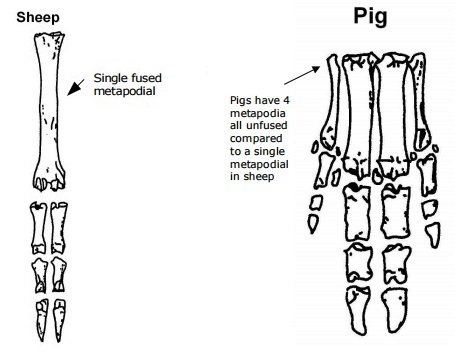 The shape of the lower limb (metapodia and phalanges) is more complex in pigs than sheep, with four distinct phalanges all unfused to one another, as opposed to sheep which have a single metacarpal comprised of two fused bones (see Figure 9). As with cattle this has resulted in a double “cotton reel” shape at the distal end in sheep. 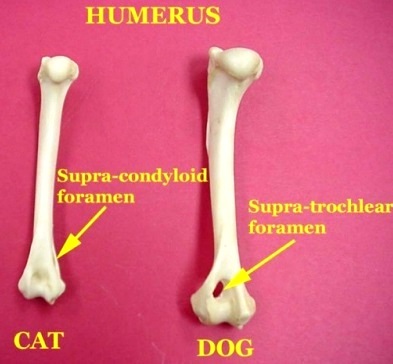 Whilst differences in dogs and cats are largely beyond the scope of this introduction it is worth noting a difference in the distal humerus as its robusticity means it is the one of the most commonly found elements on archaeological sites. As one can see in Figure 10, both dog and cat humerii have a hole (foramen) through the distal articulation. In dogs this runs through the articulation whereas in cats in runs to the side. Pigs have 4 metapodia all unfused compared to a single metapodial in sheep Single fused metapodial. Hillson, S. 2002 Mammal Bones and Teeth: An Introductory Guide to Methods of Identification. Left Coast Press. Pales, C. and 1971 Atlas Osteologique pour servir a l’identification des Lambert, L. Mammiferes du Quaternaire. Schmid, E. 1972 Atlas of Animal Bones. White, T. 2011 Human Osteology. Third Edition. Academic Press. Cohen, A. and 1991 Manual for the Identification of Bird Bones from Serjeantson, D. Archaeological Sites. This step by step guide to archaeological techniques is one of a series prepared by Jigsaw – a network of Cambridgeshire groups working alongside Oxford Archaeology East. The guides are available for download from the Jigsaw Website. Copyright in these guides belongs to Jigsaw and the authors.